Would you like to visit your family or friends? Do you plan to visit the Christmas market in Vienna, Graz or Prague? Or would you like to go somewhere to relax before the holidays? 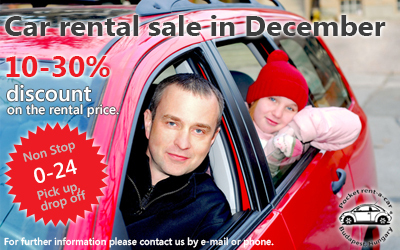 Rent a car now on 10-30% lower rental price! You can pick up and drop off your car 0-24, at Liszt Ferenc International Airport, at our rent a car premise or everywhere in Budapest. The promotion is valid if you make a reservation for a period of between 2 December 2015 and 20 December 2015. All discounts are subject to the free supply and Terms&Conditions. The price includes highway-use and non-stop assistance.